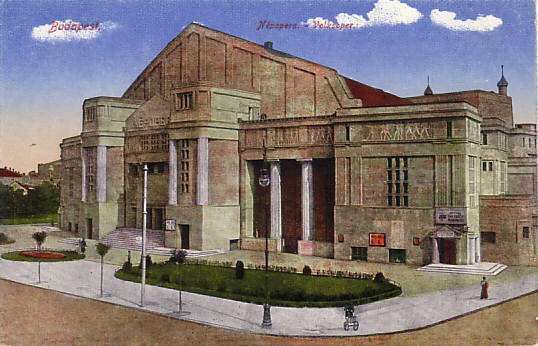 Built 1912-1913 as a private opera house, "Népopera"/"Volksoper", by M. Komor and D. Jacob with Géza Márkus. From 1917 operated by the city of Budapest. Subsequently interior rebuilding by Vago Laszlo. After World War II, operated by the Hungarian State Opera and renamed "Erkel Színház" in honour of the Hungarian opera composer and conductor, Ferenc Erkel (1810-1893). 1951-1952 auditorium rebuilding by Oskar Kaufmann. 1959-1961 new façade and extensions by foyers and function rooms by Iván Kotsis. 2340 seats. 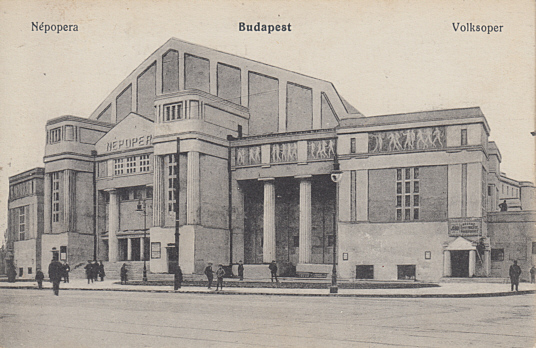 Front Text: "Budapest", "Népopera - Volksoper"
Front Text: "Népopera - Budapest - Volksoper"